Below you will find a basic hemp necklace pattern that is easy to follow with step by step pictures. If you do not have a macrame board, you can either use a clipboard or make your own with a small board and nail. 1. Cut one 5-yard (4.5 meter) length of hemp. 2. Cut another length, twice as long as the piece of jewelery, plus a few extra inches. This necklace will be about 1.5 feet (~0.5 meter) long, so a single yard (almost a meter) would be appropriate. 3. Fold these lengths in half with the shorter length. on the inside and the 5-yard (4.5 meter) length on the outside. The longer 5-yard (4.5 meter) cord will be what is called the "knotter" cord, which will be used to make the knots while the shorter cord will be the carrier cords, used as an anchor to hold the knots. Make a loop at the end by tying an overhand knot. Line up the cords with the shorter ones on the inside and the longer ones on the outside. If you cannot get them to line up just right you will need to untie your knot and retie it with the cords lined up better. Make a loop with the cord to the far right Bring the cord underneath the first two cords to the left and over the last one. Continue knotting until you reach an inch in length, which will be about 17 knots. String your first bead on the two middle cords. Tie the two outer cords underneath the bead. 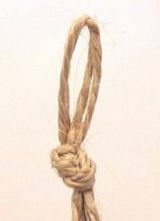 Resume knotting with half square knots as outlined above until you have knotted 6 inches (15.2 cm). Attach a pendant to your necklace by stringing it onto the bottom cord, if you wish. Continue to knot and bead for another 6 inches (15.2 cm). Tie another overhand knot at the end. Apply Elmer's glue as you are tying it. Cut any excess cord about 5 inches (12.7 cm) from the overhand knot so you have plenty of length to adjust and tie with. Some people prefer to make necklaces without glue, or with an alternative to Elmer's Glue as Elmer's is water soluble. Butterfly long cords for storage by wrapping them in a figure eight pattern around your fingers. Wrap them in the middle with rubber bands so they will stay together. To make a flat design instead of a spiral, switch which side starts the half square knot each time. As an alternative to the glue, it's helpful to rub your hemp thread with beeswax before starting. It helps keep the knots tight and also helps to protect the piece from getting soiled. You can usually find bars of beeswax at hobby stores. You could end the necklace with a bigger bead that would pass through the starting loop as a button would do and would work like a clip. It is easier to work anywhere doing knots if you tie the loop to something infront of you and then tie tight the middle strings to a button in your jacket or something in your body. As the middle string keeps straight it is very fast to do the knotting and finish sooner.